My grandfather always had a robust garden filled with vegetables. His secret was rich, nutrient dense soil. He taught me that the plants we grow and soil have a symbiotic relationship. If the soil has nutrients, the plants will thrive. That said, many gardeners forget this vital tip and tend to lean towards chemical fertilizers as a way to quickly replenish their soil and grow their plants. Overtime, this can can cause the soil to become depleted of vital nutrients because the fertilizers kill or leaches out the nutritional aspects of the soil. As well, chemical fertilizers are not welcoming to microorganisms that live in the soil. You want to ensure the fertilizer method you use is biodynamic and efficient in the amount of materials used versus the amount of coverage area. Foremost, it is important to understand what soil actually is. According to the Soil Science Society of America , “Soil is not dirt. It is a complex mix of ingredients: minerals, air, water, and organic matter – countless organisms and the decaying remains of once living things. Soil is made of life. Soil makes life. And soil is life.” In order for plants to grow to their optimum capacity, they need nine different nutrients present in the soil. While most of these elements and nutrients are naturally found in soil, sometimes they can become depleted and need to be added to keep the soil healthy. 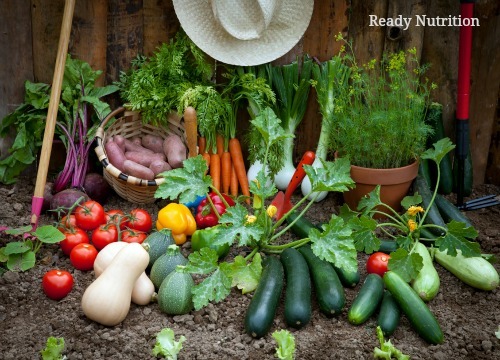 Creating a no-till garden or utilizing the sheet mulching method  can add these vital elements and nutrients back to the soil. This is a type of whole-system approach to gardening  that helps feed the soil while vegetables and crops are growing. Another way to do so is by using an old-fashioned compost tea will help restore many of these essential nutrients, microorganisms and vital minerals naturally. It should be stated that the elements listed above are not the only things that should be present in the soil. Microbes such as protozoa, fungi, algae and bacterias should also be present, as they affect soil structure and fertility. In fact, millions upon millions of microbes are present in healthy soil and it is important to ensure they make your soil their home. Ensuring that you have a lot of biomass present in your soil  will keep them thriving. Compost tea takes the beneficial bacteria and fungus present in compost and exponentially increases them through aeration and sugars. These bacteria and fungus are critical in root establishment – and the more bacteria you have in your soil, the better. In fact, if you diversify your bacterias, you will make a healthier soil and compost tea is one of the easiest ways to do this. Note: I will also add some earthworm tea that I have from my earthworms and this adds even more nutrients to the brew! Add water to a 5-gallon plastic bucket. If you are using tap water, allow water to sit for 24 hours in order for chlorine and other chemicals to dissipate. Add liqui ingredients to water in 5-gallon bucket and stir until incorporated. In pillowcase or nylon stocking, add dry ingredients (rock dust, inoculant, manure, worm castings, etc.) and tie onto stick and add to bucket. Turn on aquarium pump with hose attached and oxygenate water for 18-24 hours. This will help the beneficial bacterias, minerals and sugars activate. Periodically check on brew. There should be a nice foam at the top. After 24 hours, turn off pump and remove dry ingredients (add to compost pile). Use compost tea as a foliar spray or root drench. Note: Do not over-brew your compost tea. Twenty four hours is all it needs to get the protozoa and fungi kickstarted into reproduction. You can use the tea as often as you wish. I used it once a month on my garden, or when I thought the plants needed a little extra TLC. In fact, you can also use compost tea to prevent plant shock by soaking new plants in compost tea before planting. It does double duty by giving the plants a good soaking prior to planting and adds beneficial microorganisms to the fragile root systems. As well, I have had a lot of success using it as a foliar spray and as a root drench and after a three month period, I was very impressed with the soil. It was fluffy, retained moisture and I noticed more beneficial insects coming around more. Another highlight of using compost tea was when harvest time came, the vegetables tasted sweeter than usual. I’m not sure if this was a result for the compost tea or just a fluke, but I felt that it had to be mentioned. As well, I had no issues with molds or diseases this year and believe it to be a result of the compost tea I used. This is by far the easiest way to get essential nutrients quickly into the soil, and I love that it can also be used as a foliar spray. As well, the initial investment of compost tea ingredients will provide for many uses; so I can make compost tea all year with the ingredients that I purchased in May! Once again, my grandfather was right about giving the soil what it needs to thrive and proved it by the bountiful harvests he had year after year. I highly recommend using this in preparation for your upcoming gardens. I have had nothing but success with this natural fertilizer method and look forward to my next harvest.